Summary: A years-long drought in the land of Morven’s people forces them to leave their home to find a new place to live with water. But leaving begins an unforeseen chain of events that will change their tribe forever. Morven, who has always been a bit of an outsider in her clan finds her place outside gender norms and among wild horses who live near by. Able to tame a black stallion, Morven introduces her people to a new way of life that involves caring for animals and letting horses do work that the women used to do. While searching for a new home they encounter other peoples with different ideas about how to live, and when those ideas conflict enemies are made and the warring begins. Review: Similar to Dawn Rider by Jan Hudson, Morven and the Horse Clan by Luanne Armstrong explores one young woman’s journey to be true to herself in the midst of strong gender roles. Expected to grow up and have a family of her own, Morven is drawn to hunting and animals instead. She doesn’t feel the pull to get married and have children and finds solace when she encounters a group of wild horses displaced by her tribe as they seek a new place to settle in the face of an intense drought. Being able to learn to communicate with the horses and ride them intimidates her clan further, but ultimately their path is changed as a result. For Morven it’s a journey of self-discovery. Plagued by uncertainty about her place in the clan, Morven isn’t sure if she would rather be alone living with her animal friends or supporting her tribe and family. Over the course of the book though, certain ideas are revealed. Living off the land at the mercy of weather and animal migration is challenging, and highlights how everything is connected. I was also intrigued by the Kazaan tribe because I wondered how they learned the concept of ownership and entitlement. When Kai tries to proposition Morven and she rebuffs him with physical violence, he becomes angry because he feels he should be able to have her if he wants to. Unfortunately this perceived humiliation is what fuels his interest in war, but I like how Morven has her time alone where she struggles over everything that has happened and emerges as a future shaman leader of her people. I think it’s the start of a series, and Morven is certainly a strong character to read about. 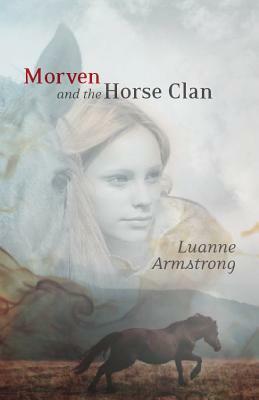 Morven and the Horse Clan by Luanne Armstrong is published by Great Plains Teen Fiction, (2013).